This taco bowl is loaded with three lots of veg, anti-inflammatory turmeric and deliciously creamy avo! Gluten-free, dairy-free and all cooked in 5 minutes too... winning! 2 cups white cabbage, shredded. 2 cups purple cabbage, shredded. 500 g white fish, diced into 2cm pieces. 1. Prepare the Spicy Fish by adding the turmeric, chilli, salt and pepper to a large bowl. Combine with a spoon, then add in the fish pieces. Stir until the pieces are coated in the mix. 2. Add enough olive oil to coat the base of a large frying pan and heat over a medium-high heat. Add in the fish pieces and fry for about 5 minutes, or until fish is golden and cooked through. You may also have to do this in batches. Once fish is cooked, set aside on a plate lined with a paper towel. 3. Meanwhile, prepare the taco bowl by combining the cabbage, cucumber, vinegar and olive oil in a large bowl. Season with salt and pepper, to taste. Divide this mix between four serving bowls. 4. 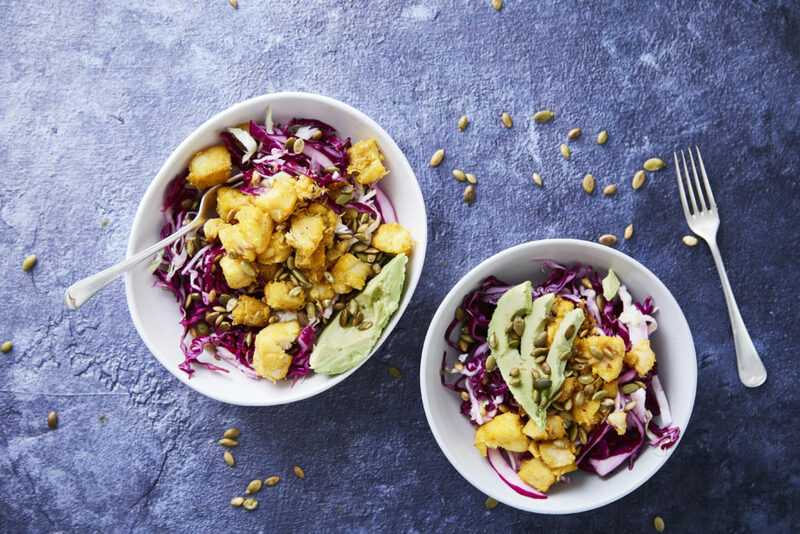 Top each bowl with an equal portion of Spicy Fish pieces, ¼ avo each and pepita serves to serve.